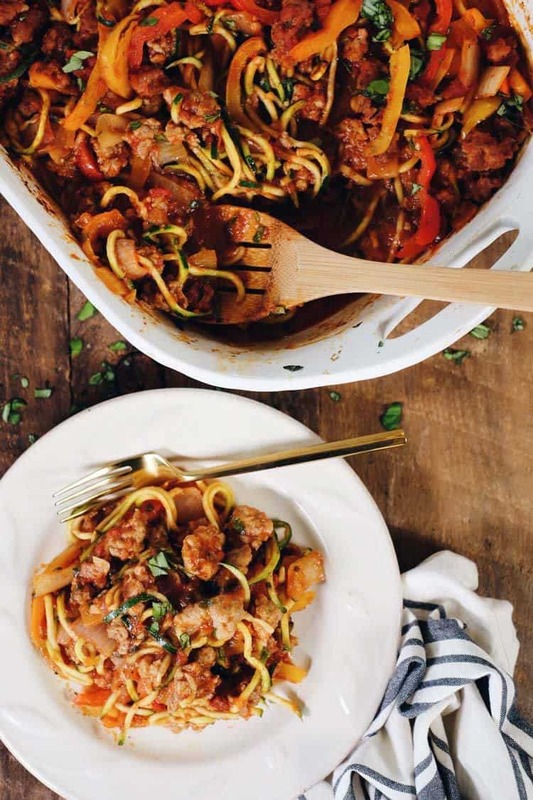 When it comes to making dinner, we love a simple recipe that we can throw together with minimal ingredients and effort. This easy zucchini casserole is not only packed with veggies, but it’s a breeze to make! This recipe calls for only 7 real food ingredients, with one additional optional ingredient if you tolerate and enjoy dairy. But seriously, as much as I love a little parmesan added on sometimes, this dish is so flavorful that you don’t even need the cheese. 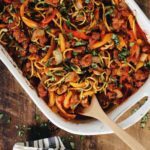 The rest of the ingredients are simple, like Italian sausage, onions, bell peppers, garlic and marinara sauce. Just make sure to use a marinara sauce with no sugar listed in the ingredients. If you have tried making a zucchini casserole or lasagna, did it turn into a soupy, watery mess? Well, we have been there and wanted to avoid it for this dish. For this casserole, we decided to ring out the zucchini noodles in some paper towels before loading them into our casserole dish. Getting the extra water out before cooking them really helps to ensure you don’t end up with a soupy casserole. 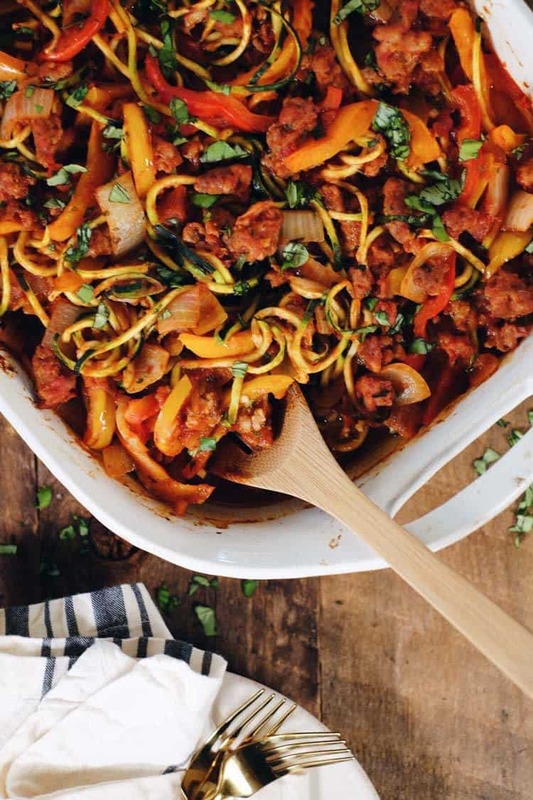 Once the zucchini has been turned into noodles with a spiralizer and rung out, all you do is cook the Italian Sausage, and while the sausage is cooking, prep the rest of the veggies. You’ll cook them just till they start to get tender and add the marinara sauce. Then, all you do is put it all together in your casserole dish and bake for 15 minutes. 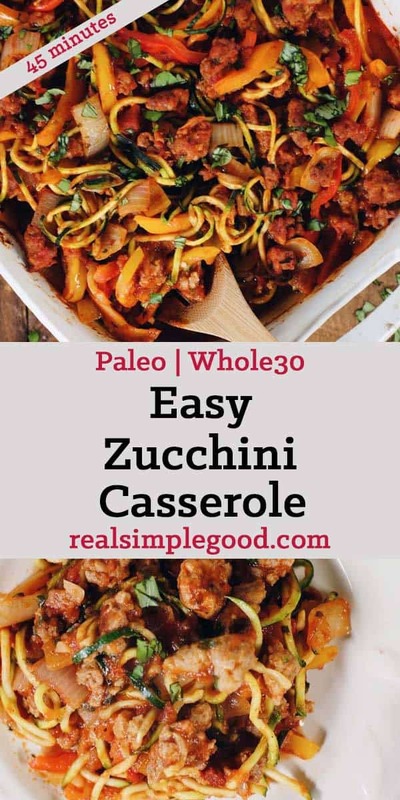 If you’re looking for a healthy and easy casserole dish that is simple and flavorful, make this easy zucchini casserole! Let us know how it goes by leaving a comment below. Also, take a photo and tag us in Instagram @realsimplegood, so we can check it out! 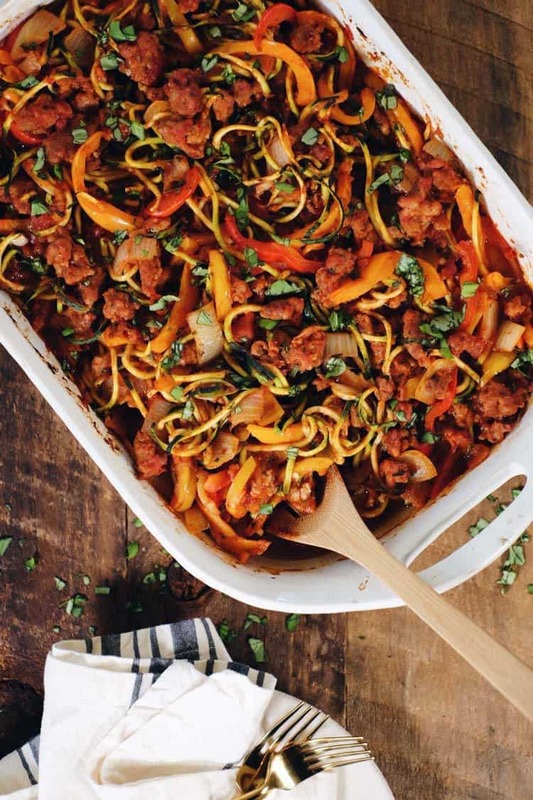 This simple and healthy casserole is great for a busy weeknight and for making leftovers. 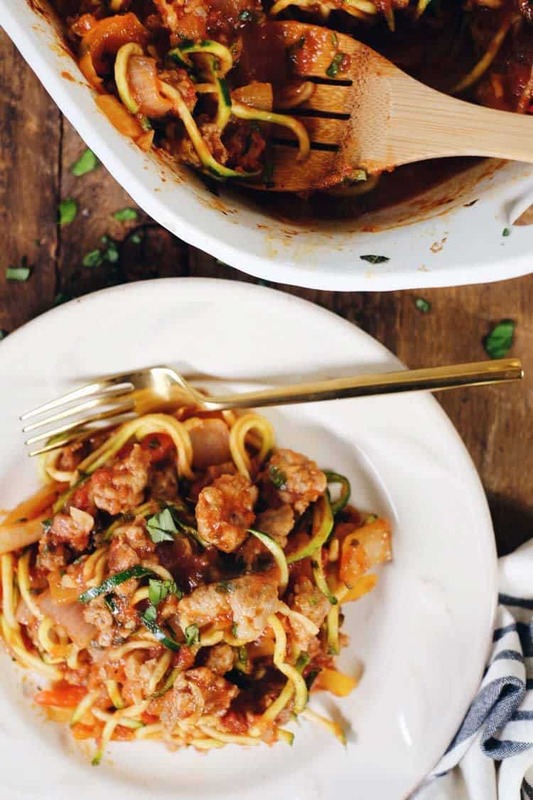 First, turn zucchini into noodles with a spiralizer. Break the noodles up into smaller sections of 6-8 inches with your hands or scissors. Using paper towels to wrap around the noodles, squeeze the noodles to get some of the water out of them. Set aside. Heat a large skillet over medium-high heat. Once hot, add in sausage to cook. Break it into small chunks and cook, stirring occasionally, until it is browned and some crispy bits have formed throughout, about 8-10 minutes. While the sausage is cooking, cut up bell peppers, onion and garlic as noted. Once the sausage is cooked, remove it from the skillet and place in on a plate for later. In the same skillet over medium-high heat, add in onions and peppers to cook, stirring frequently. Cook until they begin to soften, about 3-4 minutes. Add in garlic and cook for 1-2 more minutes. Add the pasta sauce, cooked sausage and basil to the skillet. Stir everything together to mix well. Turn heat down to medium-low and allow the pasta sauce to to heat up for a few minutes. Place the noodles in a 9x13 baking dish. Pour the sauce all over the noodles to cover evenly. Top with cheese (optional) and bake for 15 minutes, or until the cheese is melted and the noodles are warmed through. Remove from the oven, serve and enjoy. My triplets are such picky eaters this finally got their attention lol. They absolutely loved the zucchini casserole!!!!!!! added asparagus and diced tomatoes it is delicious!! My two and four year olds slurped this meal down happily as did my (age redacted) husband who previously scoffed at the idea of “zoodles”. I will, without a doubt, be making this again. That’s so great to hear! Thanks for trying our recipe and coming back to leave a comment!